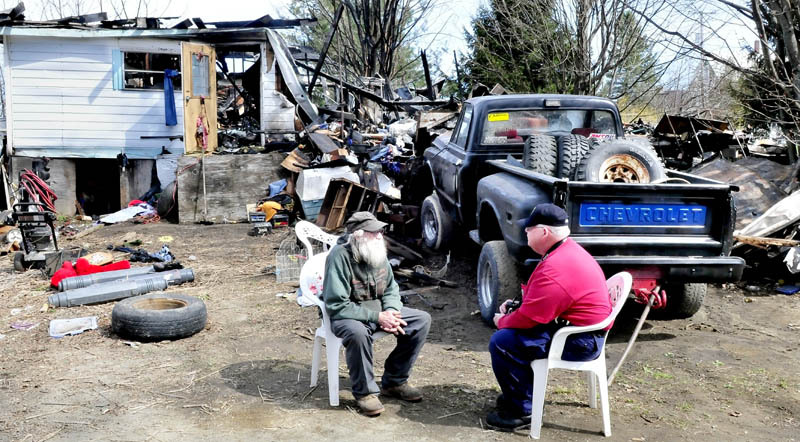 Family and friends of the Benton man that lost his home to a fire this week searched through the rubble for anything salvageable. BENTON — Clyde Berry sat in the rubble of what was once his bedroom, watching his relatives sift through the soot-covered piles all around him. Their faces and hands were streaked black, their clothes dirty. They scraped with shovels, hoes and their bare hands, searching for anything salvageable from Berry’s 60-plus years of living in his now destroyed home. On Wednesday, they found his late wife, Gail’s, wedding rings. “Gail’s piggy bank,” Berry’s daughter-in-law, Barbara Berry, said as she unearthed a large pink ceramic pig and presented it to him. 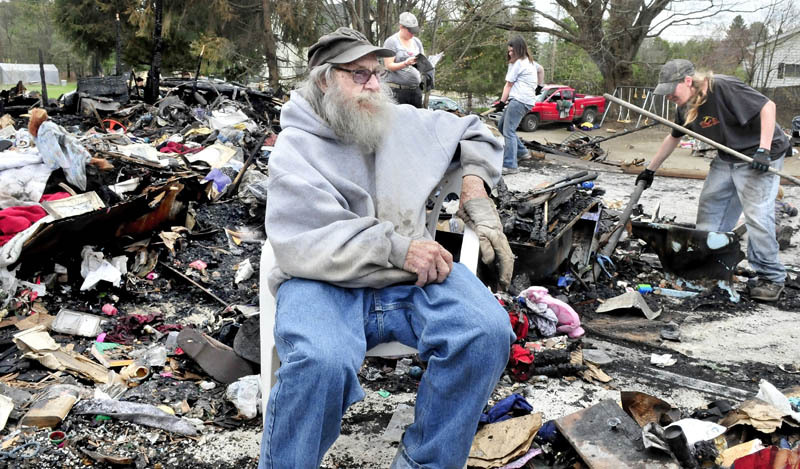 Clyde, 82, lost nearly everything in a fire early Monday at his double-wide mobile home at 1594 Benton Ave. He was uninsured. Fire officials said they suspect the fire started under the home as the result of an electrical problem. Berry’s most precious belongings were his two dogs — Buster, a beagle, and Libby, a black Labrador retriever mix — and a cat, Baby. They are still unaccounted for. Berry said the cat has a spot of white under his chin and white toes on all four paws. As he spoke, he sat in a plastic lawn chair, recounting all the people who have come to help him over the last few days. The town of Benton is paying for him to stay at the American Lounge motel in Fairfield for 30 days, he said. People have been stopping at the fire site and donating $50 here and $20 there. Hillman’s Bakery in Fairfield, where Clyde Berry’s niece, Sharon Stowe, works, has a donation can on the counter for him. One woman bought him a box of brand new dishes and silverware and others have donated clothes, but the most generous gift came from a Fairfield woman, Lisa Sylvain, who is giving him a trailer that will be placed on his property once the debris is cleaned up. The trailer is an older mobile home from the 1960s, but it has new wiring and pipes, as well as a new hardwood floor, Derrick and Barbara Berry said. “She’s definitely going to be the biggest one we thank,” Barbara said. Clyde said he did not know how to thank all the people, many of whom he does not know. They have helped to raise his spirits. Losing his belongings and the memorabilia his late wife collected over the years has been hard, he said. “It changes your life, loss, things like that,” he said. Barbara Berry said he still needs a bed and furniture for the two-bedroom trailer. She said anyone wanting to donate may call her at 314-4642.